Concepts are the building blocks of the mind. Active concepts represent the present state of the mind, while quiet concepts represent the stored information that is available to the mind. The brains of both humans and animals organize their information in concepts. A main difference between humans and animals is the types of operations that their brains use in handling their concepts. Several types of relationships exist between concepts. Those relationships affect how the brain processes information and controls the activities of the body and the mind. Some of those relationships exist in the minds of all animals, including humans. Some relationships are typical to the species. The following relationships are universal: they are supported by the brains of all animals. Temporal relationships are one type of basic relationships between concepts that the brain recognizes and uses. The brain has innate mechanisms that enable it to detect and to record the temporal relationships of two concepts; whether they occur at the same time-interval, or if one concept follows the other. The size of the time-interval, though, is not fixed. It may be long, as in “when I was a child I played with toys”, or short, as in “when I opened the refrigerator the light came on”. In order to effectively control the activities of the body in environments that may be non-cooperative or even hostile, the brain has to be able to do two things. First, it has to be able to focus on few concepts out of the incessant stream of millions signals that it receives. Second, it has to be able to benefit from previous experiences. Once it has identifies the relevant concepts, it should be able to retrieve from memory and use past experiences that are related to the ongoing situation. The brain satisfies those requirements by relying on two types of basic relationships: the item-parts and the class-exemplars relationships. In an item-parts relationship, the item is a concept that represents a group of other concepts – its parts – that occur together or in a temporal pattern. We will call a group of concepts that occur together spatial. For example, ‘person’ is an item, whose spatial parts ‘head’, ‘hands’, 'chest', etc. occur at the same time. A 'week' is a concept whose temporal parts 'Monday', 'Tuesday', etc. occur in a sequence. Fireworks is a concept with spatio-temporal parts. When the brain handles the concept ‘person’, it does not need to handle its parts. However, should it become necessary, those parts are readily available through their relationship with the item. When the brain encounters simultaneously the concepts ‘head’ and ‘hands’, it may infer that ‘person’ is present in the scene. It then may shift to handling the one concept ‘person’, instead of handling its several observed parts. Since 'head' and 'hands' are parts of the item 'person', the brain may also decide that other unnoticed parts of 'person' might be present. It may add to the existing parts 'head' and 'hands' missing parts such as 'chest' and 'legs'. The brain relies on item-parts relationships in various situations. In certain situations the brain prefers to deal only with the item as a whole, and not consider the parts. That simplifies the processing of information. In other cases, only some of the parts are present, and they cause the brain to conclude that the entire item is present. Such a group of parts is called a cue. Based on the cue, the brain may proceed and handle the item, instead of handling the parts that are present. It may also decide to supplement the existing parts with the missing ones. If that happens, we say that the group of existing parts inherits the missing parts from the item. In those processes, the brain uses previous experiences – the relationship between an item and all its parts – to supplement partial information. In a class-exemplars relationship, the class is a concept that is associated with a group of items that have something in common – the exemplars. 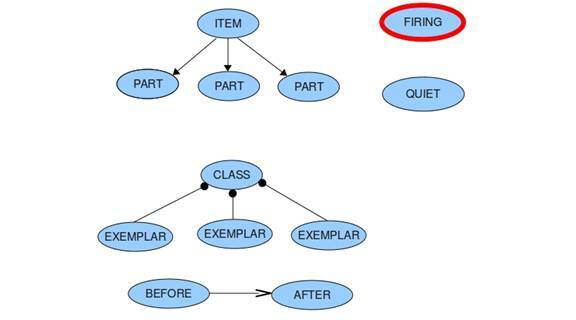 Unlike parts of an item, exemplars of a class do not have to occur at the same time or in a temporal pattern. For example ‘an animal’ is a class whose exemplars are ‘human’ ‘bird’, etc. The presence of 'human' does not imply the presence of 'bird'. In addition to exemplars, a class has a list of cues and a legacy list. An Item that possesses a cue from that list qualifies to become an exemplar of the class. Once it becomes an exemplar, it inherits the items that are included in the legacy list. This is an efficient way of merging previous experiences with ongoing situations. For example, when seeing a centipede for the first time, a child will have no difficulty deciding, based on available cues, that this is an animal. It has legs, it moves, it responds to prodding, etc. The brain of the child first assembled into an item all the sensory information originated from the centipede. Then, the brain classified that item as an exemplar of the class 'animal'. This was done based on cues of the class 'animal' that the centipede possessed such as wiggling, moving feet, and responding to prods. Then the child wonders; what does the centipede eat? All animals must eat. Since the centipede is an exemplar of the class ‘animal’, it inherits the legacy of that class, which is common to all its exemplars. In this case, 'eating' is part of the legacy of 'animal'. Then the child may ponder, should I squash it? The child is now using few concepts such as ‘animal’, ‘strange’, ‘scary’, ‘kill’, ‘squash’ in handling information that involves emotions and past experiences, which were triggered by millions of external sensory and internal signals. A concept may play different roles in different relationships with other concepts. The same concept may be a part, an item, a class, or an exemplar of other concepts. It may also have different temporal relationships with different concepts. Notations of the item-parts, class exemplars and temporal associations, and of firing and quiet node. The type of the arrow indicates the type of the association, and the role of the nodes in it. A synapse in a nodal network indicates that the two nodes that it connects are associated. This kind of association is called explicit. However, two nodes may be associated with each other even if they are not directly connected by a synapse. Such two nodes have intermediary nodes that connect them, and the nature of the relationship between the two nodes is determined by those in-between synapses. This kind of association is called implicit. For example, 'my nose is a part of my face' and 'my face is a part of my head' are two part-item relationships. A synapse connects 'nose' and 'face' and another synapse connects 'face' and 'head'. These are explicit relationships. The relationship 'my nose is a part of my head' is also a part-item relationship, and it is included in the information of that network, even if the nodes 'nose' and 'head' are not directly connected by a synapse. This is an implicit relationship. It is implied by the explicit relationships, because the basic relationship 'is a part of' is transitive. Two nodes that are associated implicitly may become associated explicitly (be explicated) by adding a synapse between them. That will create redundancy in the system, because the same information is now represented in several ways. Redundancies use more hardware resources, but on the other hand, they backup the stored information, and may facilitate the retrieval. The nodal networks of the brain allow redundancies. The statements: “this apple has a red skin” and “this apple is a red object” convey equivalent information. The first statement uses the item-part relationship and the second the class-exemplar relationship. This is another type of a common redundancy. The same fact can be expressed as an item-part and as exemplar-class relationships. If only one of the statements is explicit, the other is automatically implied. Those universal relationships between concepts are bi-directional: If 'dog' is an exemplar of 'animal', then an 'animal' is the class of 'dog'. Such bi-directionality exists between reality concepts, between mental concepts, and between labels. However, across those groups relationships are more fragmented. Relationships between reality concepts and mental concepts and between reality concepts and labels are unidirectional; from reality to mental and from reality to labels. Reality concepts can activate their associated mental and label concepts, but not the other way around. (If that happens, it may be considered an illness.) Many reality and mental concepts don't have labels. For example, not all flavors have names. Labels that are defined as relationships of other labels may not have corresponding reality concepts; for example, a five legged dog.